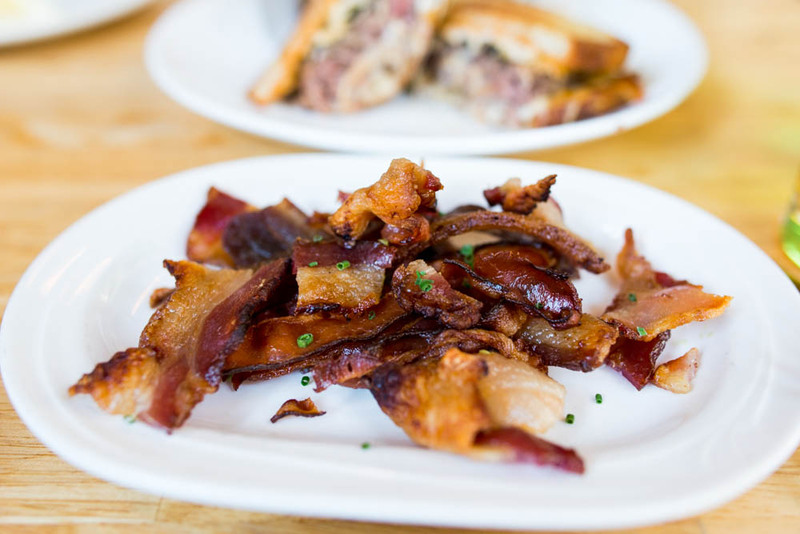 My most recent Sunday brunch at Jeffrey’s Grocery was like reconnecting with an old friend who has gone through a makeover. In addition to a brand new kitchen, the restaurant revealed a new menu without almost not a single item from the old menu remaining except for the raw bar. I was a huge fan of the old brunch here so pardon me for being a little skeptical when I began my meal. 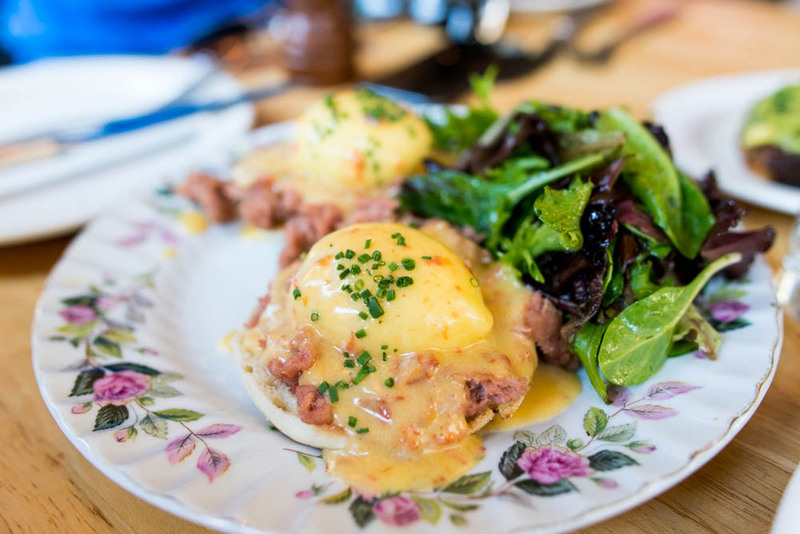 Jeffrey’s new take on brunch includes an eggs Benedict served with a savory smooth pork rillette. And instead a boring hollandaise, these came with a flavorful roasted tomato hollandaise. Boring scrambled eggs have no spot here. 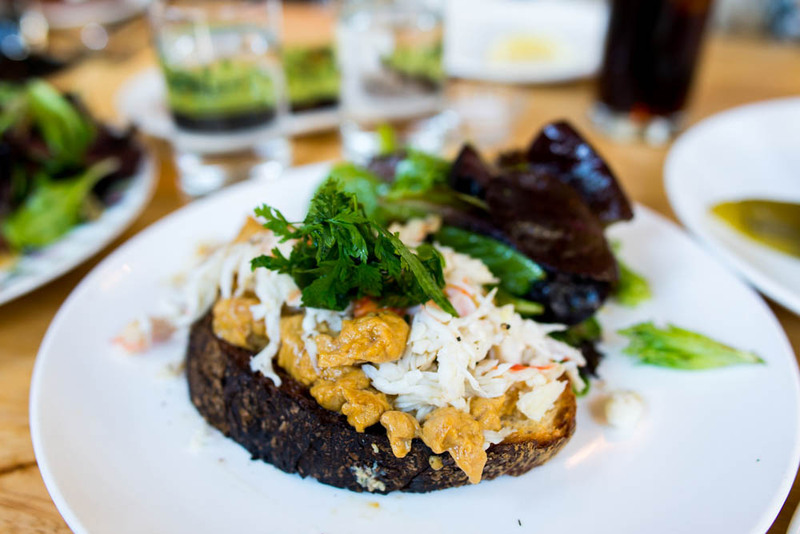 Instead, the kitchen here elevated the typical dish by folding in lobster and just as a little cherry on top, the tender pile of eggs were complete with chunks of crab meat. What an luxurious treat. Even the burger got a special treatment. 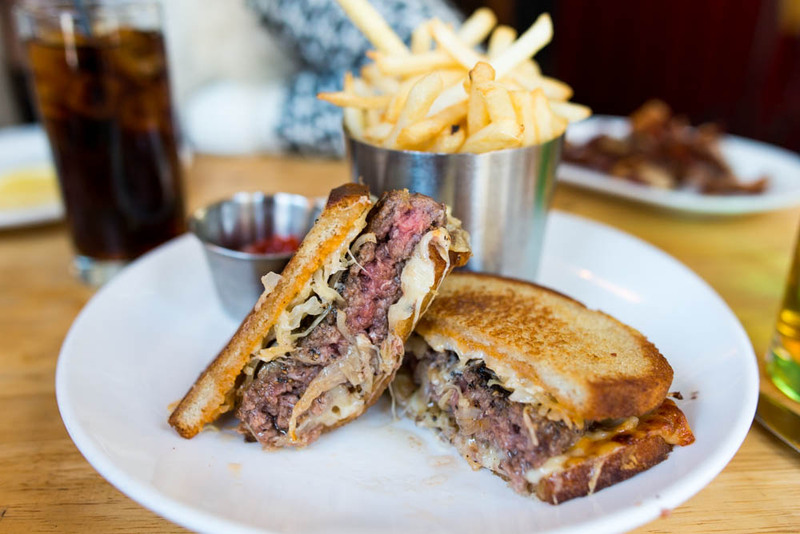 Served on toasted rye bread, the pastrami burgers were made with a special house blend a la Pat LaFrieda consisting of a mixture of sirloin, brisket and chuck. The patty was finished with a pastrami seasoning that gave the juicy beefy burger fantastic flavor. All it needed was a little bit of swiss cheese, Russian dressing and sauerkraut. One thing that Jeffrey’s did not reinvent were the fries. Keeping it classic, the perfectly crispy fast food style fries were so good that we asked for a second serving. Just in case you were still hankering for some extra sides, order a few items off the sides. 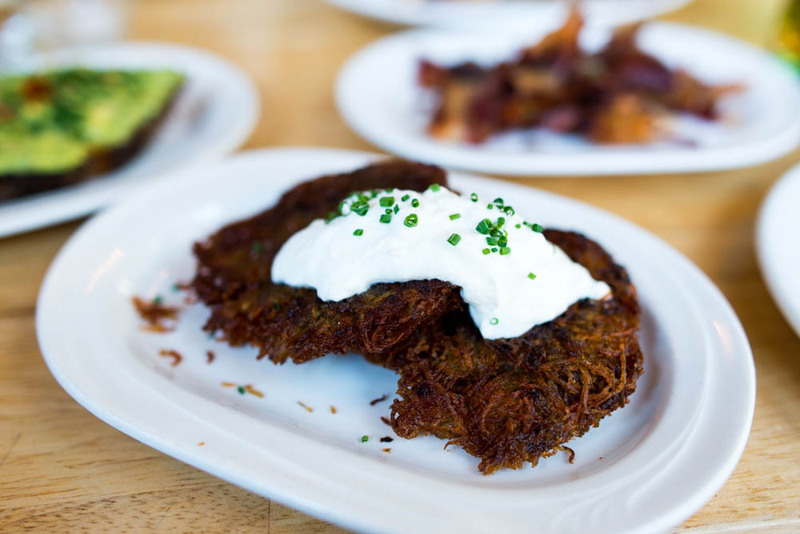 A crunchy fresh out of the fryer potato latke with sour cream and crispy bacon were traditional choices. 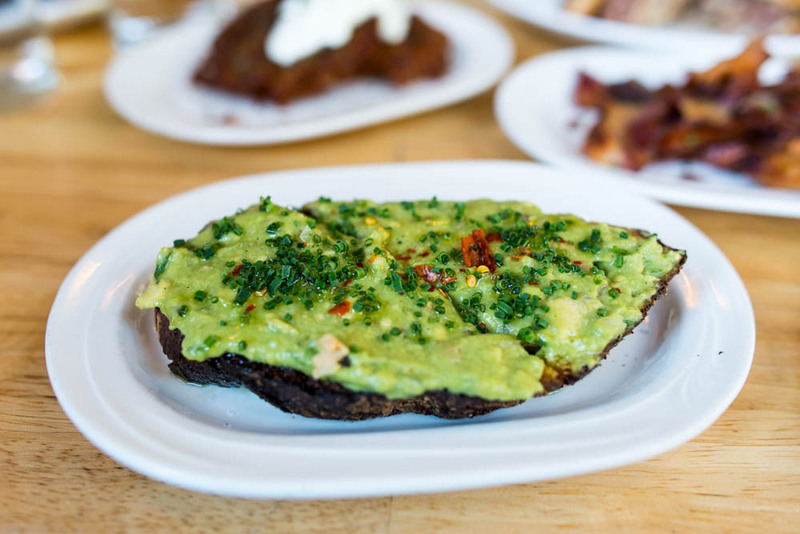 Picking up on one of the most popular breakfast trends of 2013, Jeffrey’s Grocery included an avocado toast on the menu. Finished with a drizzle of olive oil and sprinkle of chives, these were good but you should save your appetite and perhaps money. A leisurely brunch that resulted in three very full and happy stomachs later, I was convinced. 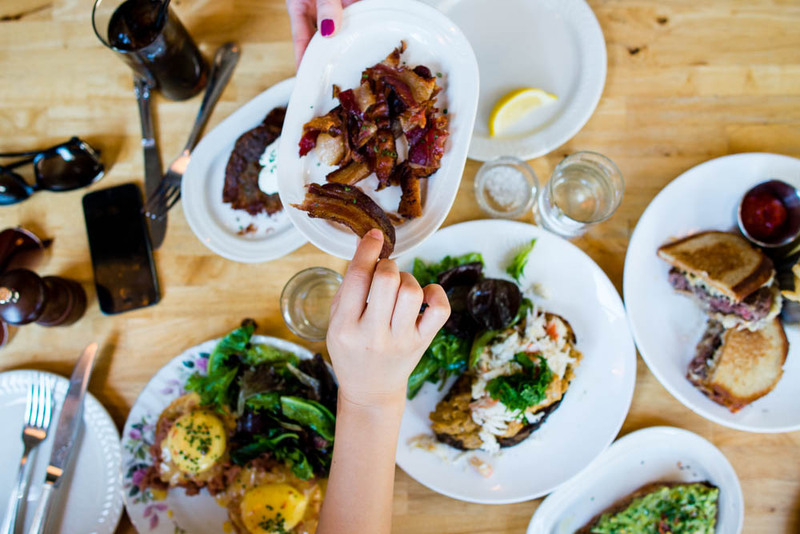 Even though I missed some of the old dishes, the cheerful vibrant atmosphere on a weekend morning at the now West Village mainstay and their commitment to fresh ingredients remained. I guess when something is fundamentally great, it doesn’t really matter how much things might appear differently on the surface.